Dylan Kane and Claire Coffman, students from our 8th grade class, had an amazing opportunity in their research paper writing process. 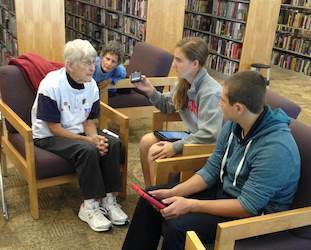 The students, who selected the Racine Belles of the All-American Girl’s Professional Baseball League, accompanied Mrs. Weaver, the Prairie SRC Director, to the Racine Public Library to listen to the annual “Wisconsin History Tour.” Author Bob Kann spoke on about his book, Joyce Westerman: Baseball Hero. The students not only were able to hear Dr. Kann speak on their research topic, but spent valuable time afterwards to interview both Dr. Kann and the highlighted Belle Ms. Westerman. This entry was posted in All School, Featured, Middle School by Communications Department. Bookmark the permalink.